Today I am going to share an interesting finding that allowed me to change the password of almost “150 million” eBay users! I was checking my e-mail when I have found a “View your recent activity” message from PayPal, I have checked the links inside the message and found an “Open Redirection” vulnerability! I have decided to report it to Paypal, I asked a friend of mine about the Paypal security e-mail, he told me that I should register on eBay to report Vulnerabilities to Paypal :). Well, I went to eBay to register and have found two other vulnerabilities while registering!, I have reported the three bugs and waited. Two days later, I tried to log in my eBay account to check the status of my 3 reports, and like every time, I have forgotten my password 🙁 . 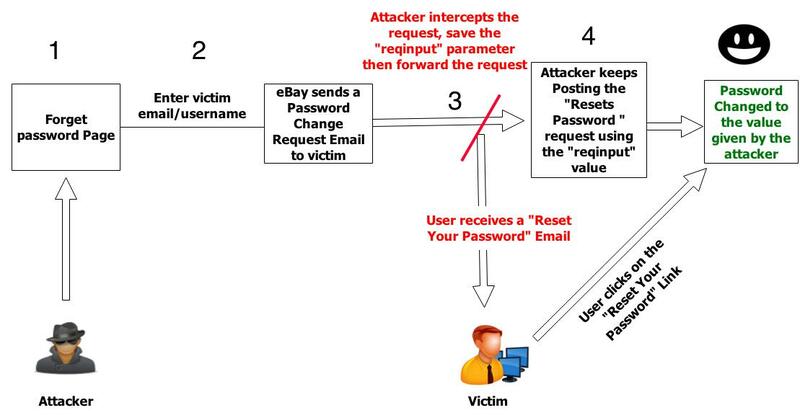 I went to ” Forget Password” page at eBay to see how secure their password reset mechanism is. 1- The user navigate ” Forget password page ” and enter his registered Email or Username. 2- eBay gives you the three options which you can change your password with (Using Email, Text message or phone call). 3- If you use Email method, they will send you an email includes a reset password link where you can change your own password. 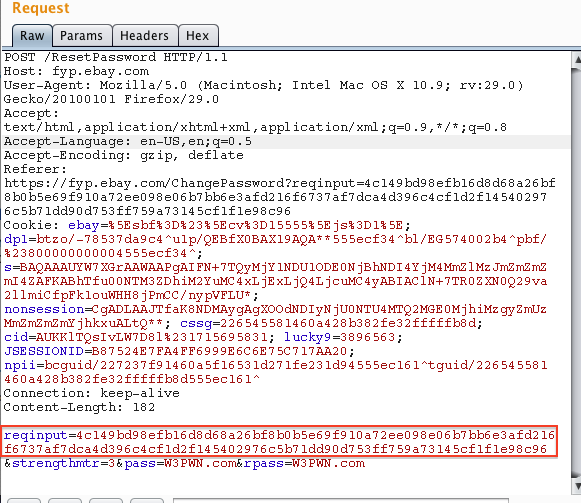 So lets fire up BurpSuite to see what happens behind the scene..
Wow, instead of using the Secret “reqinput value” that have been sent to the user’s email, eBay uses the same “reqinput” value that have been generated in the first request!!! I went again to the ” Forget Password page” then entered the victim email, then chose to send the “Reset Password link” to e-mail and captured the request and save the “reqinput value” . then I repeated the POST request “shown in the last screen shot” and replaced the reqinput value with the new one, I posted it, but it gave me error!! Today is my 28th birthday, so I decided to make this blog to share knowledge!